RSSI: Radiation Safety Services, Inc.
All RSSI Alpha-track Radon Detectors look similar to the one pictured to the upper right. 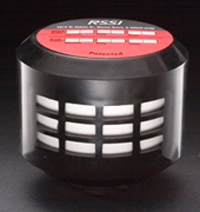 If your detector does not look like the one pictured, it is not an RSSI detector, and you will not be able to check your results on this site. If you purchased a short-term Air Check Radon Gas Test kit, go to Air Chek's web site for your results. Copyright ©2006-2015 Radiation Safety Services, Inc.